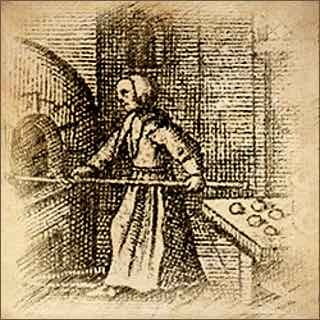 Enjoy trying authentic Renaissance biscuit recipes. 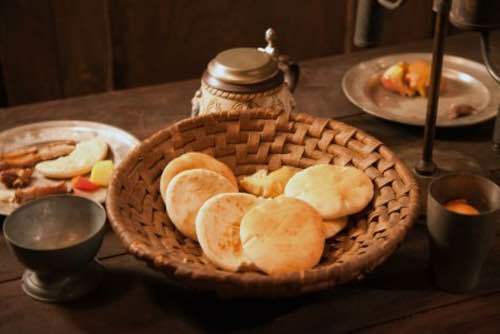 Biscuits in the Renaissance Era were not what North Americans now call biscuits. They were small sugar cakes or glazed sponge cakes, sometimes called confetti, similar to today's cookies. And like the cookie of today, they taste delicious! In medieval times, during the wedding celebration, small sweetened cakes were crumbled over the heads of a wedding couple who ate the crumbs for good fortune. This "eating together," called confarreatio, is the origin of the word "confetti" and was once the term used for the tiny, cookie-like sugar biscuits made from these early recipes. You'll have fun trying these historical cookie recipes. The sweet, cookie-like biscuits are delicious. Just don't crumble them over people's heads. It won't be appreciated. But, if you should happen to attend an Elizabethan-style wedding banquet, then by all means go ahead and crumble. 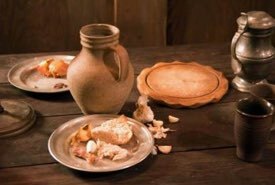 Take half a Pound of ſearced Sugar, the Yolks of ſix Eggs, a little ſearced ſpice and Seeds, and a little Ambergreece or Musk, your Eggs muſt be very hard, then put all theſe into a Mortar and beat them to a Paſte with a little Gum Dragon ſteeped in Roſewater all night, then mould it up with fine Sugar; and make it into pretty Fancies, and dry them in a warm oven. Take either of theſe preſerved and waſhed from their Syrup, beat them well in a Mortar, and then put in a little Gum Dragon as before, beat them again together till it be a perfect Paſte, then mould it up with Sugar ſearced, and make them up in what ſhape you pleaſe and dry it. Take their Roots boil'd very tender, and beat them in a Mortar with their weight of ſearced Sugar, then put in a little Gum dragon as before, beat them to a Paſte, and mould them up with Sugar ſearced, and make them up in what ſhape you pleaſe, and dry them.